In my hunt for the best stem toys 2018 I came upon circuit games! They are really neat stem games that teach kids while they play. We tested them out to see how they worked and if my 8 year old son was interested or bored. Read on to find out! If you aren’t familiar with Stem Toys you may be wondering, “What are stem toys?“. Stem stands for Science, Technology, Engineering and Math. Stem toys encourage kids to develop skills in the areas of science, technology, engineering and math while having fun at the same time. As a parent, I love stem toys because they are educational and develop skills that my kids already have and are interested in. My kids love stem toys because they are cool and intriguing. I have found that they challenge my children in good ways and help them grow their skillsets. In my hunt for the best stem toys 2018 I have found a fun new category of stem toys, stem games! Stem games challenge kids in new ways that are fun and educational. In particular, we found circuit games are a ton of fun and they are inexpensive too! 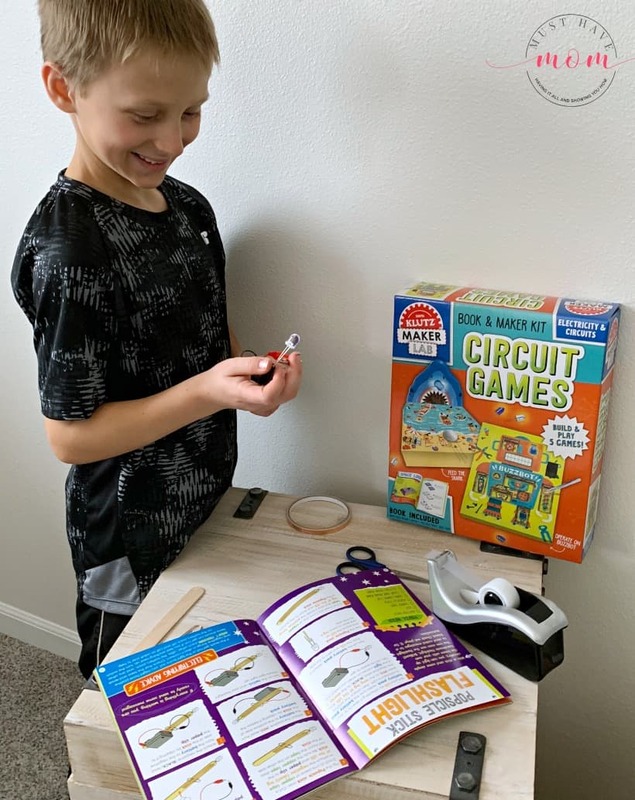 I’ll show you our favorite stem circuit game that we found which is the perfect stem educational gift idea for boys and girls. 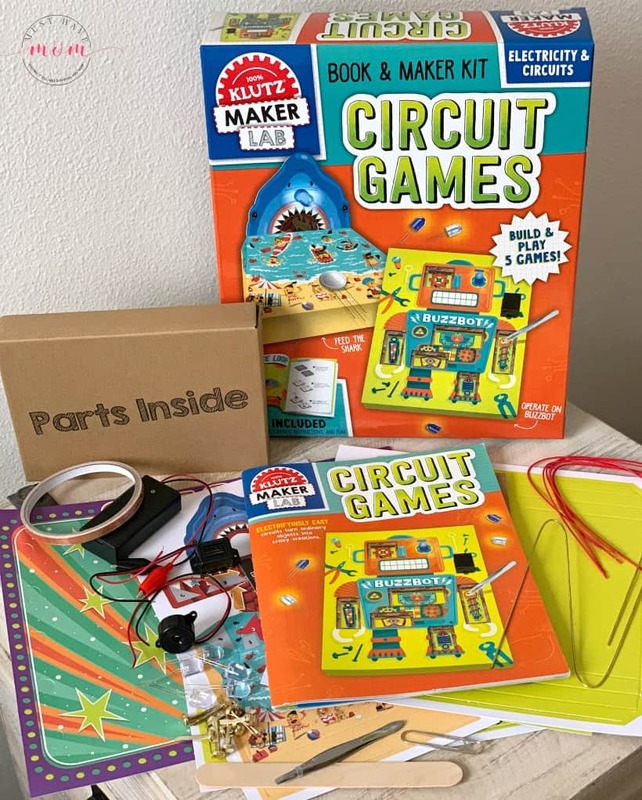 The Klutz Maker Lab Circuit Games is a boxed set of stem games that includes five circuit games kids can build from scratch while learning about circuitry! Kids will use actual electronic components to construct a DIY operation game, compete with friends in a Space Loop race, assemble a quiz show board, and more. My son was so excited for these stem games and the idea of working with real electronic components. 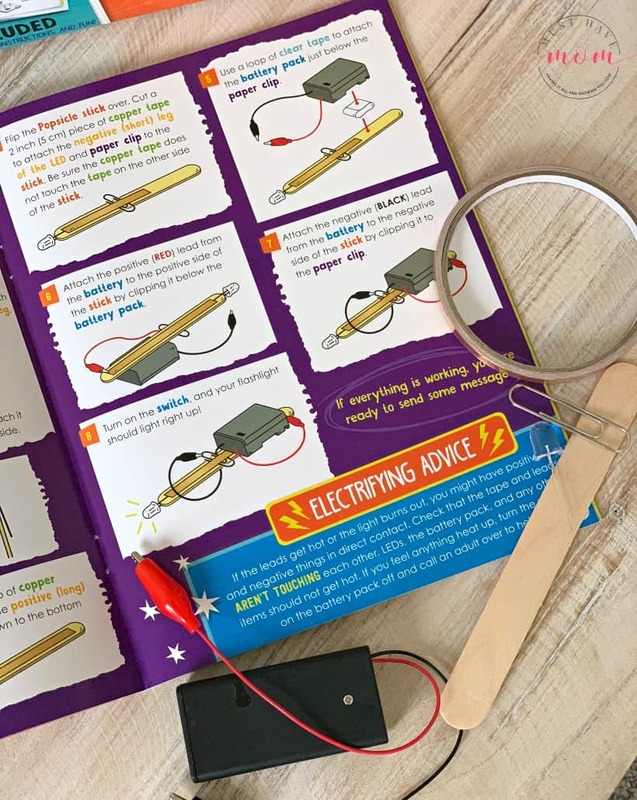 a step-by-step book of instructions that teaches you how to be a maker by adding wires, LEDs, and buzzers for super-charged fun. AA battery holder – You’ll need 2 AA batteries which are not included. Inside kids will find five different stem circuit games that they can create! My son decided to start with the popsicle stick flashlight and once he assembled that he moved on to the space loop race. The Klutz Maker Lab Circuit Games kept him busy for HOURS! My son Aiden loved working with all of the real electronic components and loved following the directions to create something that he didn’t think was possible to create on his own. It challenged him to step out of his box and try something new and challenging. The biggest reward came when he finished and was able to feel the sense of accomplishment that comes with conquering a new challenge and skill. 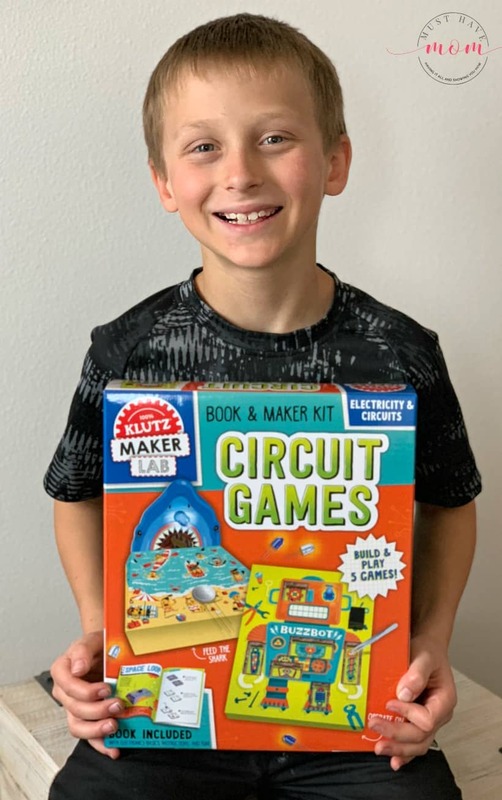 If you have a son or daughter that loves stem toys and stem education then they will flip over the Klutz Maker Lab Circuit Games. I love that it includes five different games they can make so that the fun doesn’t end with just one! Once they conquer one they can move on to the next stem game and continue to be challenged and learn new skills. Stem toys are a GREAT gift idea and I love that they challenge and entertain my kids WITHOUT contributing to the toy clutter in our house! Klutz Maker Lab Circuit Games are ideal for kids ages 8 and up! Both boys and girls alike will enjoy this stem games set! 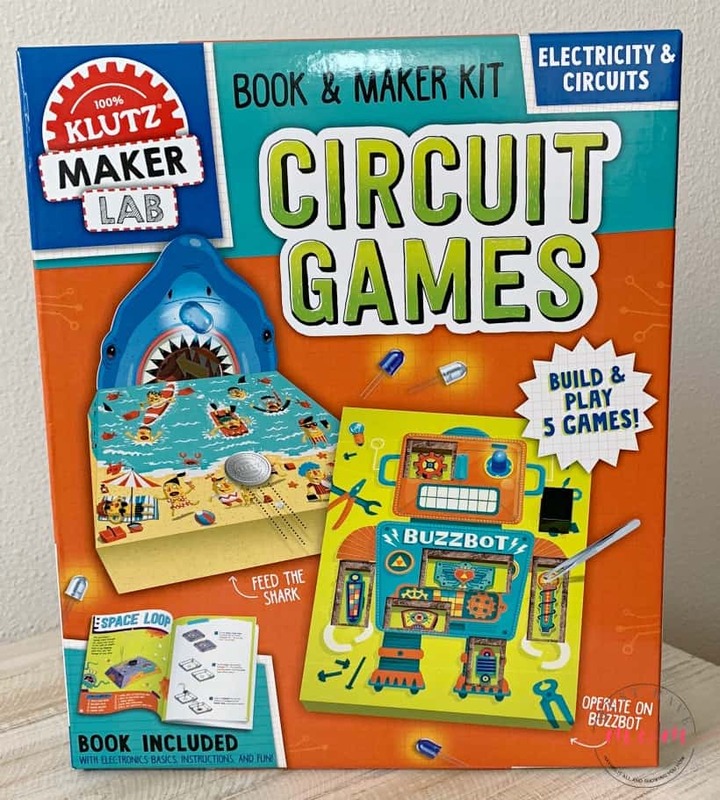 You can buy Klutz Maker Lab Circuit Games from Scholastic or on Amazon. 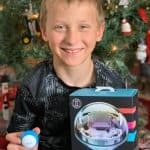 « Sphero Mini + Sphero Bolt Provide Hours Of STEAM Learning Fun! These are great picks. The best kind of learning is the kind that doesn’t feel like learning at all. My youngest son is SO into STEM stuff right now. These toys are perfect for him. My kiddo loves STEM toys! I love that he loves it. It’s educational it’s fun and he does a lot of stuff with it. I can only hope as he gets older he will continue staying interested. My youngest is such a huge fan of STEM. She loves all the products out there like this one. I bet she would just love this game too! I really liek the idea of kids learning important skills while playing. The activities in Circuit Games sound perfect for that. My daughter has been having a blast with robotic toys! She loves to assemble them and activate them via apps. That does look like a neat little toy. Sure would help get them interesting in electricity at a young age (and safely!). What a fun game! My daughter loves STEM and I could totally see her loving this! These are really awesome choices for kids! I love stem toys for my kid too. I can’t wait him to grow a little more so he can play them. That’s awesome that these play sets are educational and develop different skills. This Circuit games look so much fun to play with kids. I would highly recommend it to them, for sure they will enjoy it. 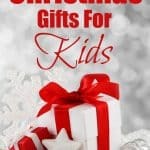 These seem like some great gifts to give kids that love this kind of thing. My daughter was really into this when she was little. I am at such a loss over what to get my son. These sound perfect! !